Ashley has trained hundreds of thousands of people on UX related topics and graduated 200+ students from GA's User Experience Design Immersive course. Ashley is a former senior User Experience Design Immersive instructor at General Assembly. The course material, which Ashley has played a major role in sculpting, emphasizes technique over theory to give students practical, job ready skills in only ten weeks. Ashley has directly taught over 200 students, and her materials have been given to thousands of UXDI students across the globe. Her graduates earn on average 20% more than they did before attending her course, and they work at organizations such as Microsoft, Amazon, Google, Wells Fargo, Disney Interactive, Frog, and Pivotal Labs. 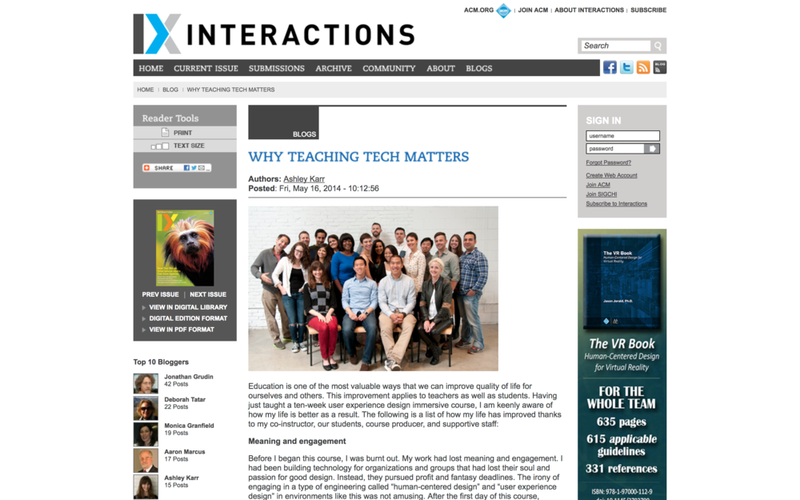 Read Ashley's article on why teaching tech matters. Ashley designed UXDI in the following way: 60% UX design consultancy, 40% accelerated master's program. She created a schedule that ran like clockwork, software labs that prepared students for modern prototyping and specification techniques, a curriculum that inspired healthy competition in neighboring HCI-related master's programs, a review cycle that generated inspiring designs and inspired designers, and a client project format that was adopted and rolled out in every GA market worldwide.